L.A. fashion girls love their nails as much as they love their sneakers, skinny jeans, and teddy coats. After all, manicures and nail art (when they're good, at least) are perhaps the most Instagrammable accessories there are. But where in the City of Angels do the most fashionable women go for their paint jobs? We polled our team of West Coast fashion editors to put together this list of the best nail salons in Los Angeles. Whether you're into simple manicures, edgy nail art, or simply a relaxing salon experience in a 'gram-worthy setting, look no further. 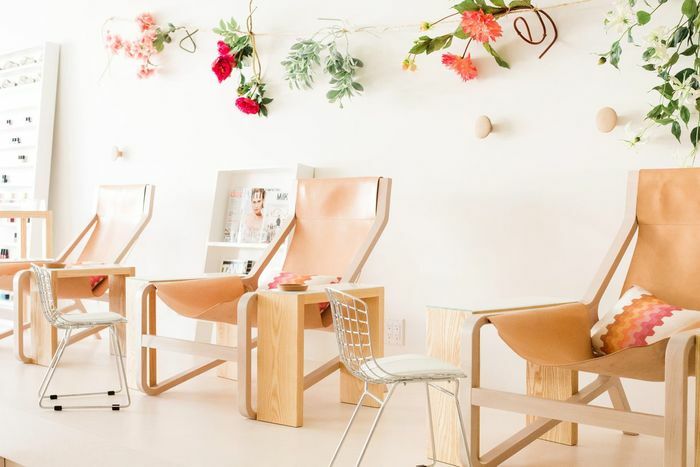 The following six nail salons are the only spots in L.A. fashion girls really love. Founder Sarah Gibson Tuttle named this beloved L.A. salon after her great-grandmother and her grandmother—and from its name to its décor, you can tell the place has cozy, familial vibes. Fashion girls are obsessed with Olive & June's polish selection, menu of services (including nail art starting at $5 per nail), and most of all the stylish ambiance, which looks like a cool desert Airbnb you'd book for Coachella. Outfitted with cozy wood paneling and black-and-white armchairs, this urban oasis of a salon (which has a larger location in the Arts District and a cozier nook on Fairfax) is not only chic but also 100% nontoxic. Base Coat has its own line of polishes and products, all of which are vegan, gluten- and cruelty-free, and use plant-based preservatives. Even the gel manis are nontoxic, using an LED light instead of UV to dry the gel and steam to remove it. Stylish aesthetic + holistic philosophy = so L.A.
You'd be hard-pressed to find a nail salon that feels more like a vacation than Côte. Bright interiors punctuated by cushy chairs, greenery, and a number of beachy apparel and tchotchkes available for purchase create the impression of a Hawaiian bungalow. Côte also has its own extensive line of gorgeous nontoxic polishes. The salon does not offer gel manis, but it does list a number of other enticing services, from hot-stone massages to crystal healing pedicures. One of New York's best-loved nail salons finds a home at the Platform in Culver City—the perfect locale for Tenoverten's ultramodern, minimalist decor and selection of 8-free, 5-free, and 3-free polishes. You also won't find gel manis here, but you will find all-natural products (including organic cuticle oil and miracle-working quick dry drops), as well as a detail-oriented staff specializing in flawlessly executed manis and pedis. If swoon-worthy nail art is your jam, meet Color Camp, L.A.'s go-to spot for dressing up your nails with foil, stripes, negative space, or any cool weird custom design you desire. Nail art here starts at $4 a nail and always comes out dope. The place also offers gel services. Oh, and the atmosphere of salon itself is as fly as the art that comes out it—modern white walls splashed with pastel tie-dye and bright blue seating. This celeb-frequented haunt (Reese Witherspoon and Jessica Alba are fans—nuff said) has lots of locations in L.A., all of which boast posh interiors featuring orchids, comfy armchairs, and chandeliers. But Bellcures' biggest draw is its extensive menu, featuring every kind of soak, scrub, and gel service you could ever want. Taking a trip to NYC? Don't miss fashion girls' favorite nail salons in the city.